I’ve stumbled upon some absolutely great old photographs of Hoylake like the one shown here! 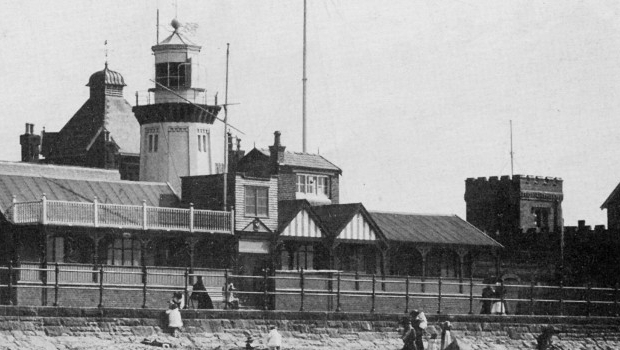 I never knew that there was a lighthouse on the site of Hoylake Sailing Club. I think they’re really good – there’s one of the commemorative plaque in the sea wall that regular reader Peter mentioned a while back. There’s one of the Railway Inns at Meols …there were actually two pubs on that site! I also like the ones of The Quadrant back in the 1950’s – that phone box wasn’t removed all that long ago. Spend some time enjoying them and share your favourites in the comments below! Fantastic photos – what a wonderfully busy place old Hoylake was! Even in the ’60s and ’70s the beach and baths would be packed out on a hot weekend. Good to see the buried plaque again! Railway Inn – I’m told there was only one Railway Inn at a time but they didn’t knock down the old one until they’d finished the new one! I thought those two Railway Inns looked strange. Great website especially if you work away and want to catch up with what’ been happening around home. To keep a pub licence, you have to open at the appointed hours without break, so to keep the licence of a pub which is being rebuilt, you wait until the new pub is finished and walk over to it with your licence at midnight. Only then can you close and demolish the old pub. This happened with the Coach and Horses in Moreton c1919. My Gt Gt grandmother ran that pub and had to get married four times to keep the licence (usually to the barman! ), as in the 1800s a woman was not actually allowed to be a licensee! The shop on fire oposite the Ship Inn was Cunninghams, and I was in the crowd watching as I initially saw the flames from as far away as Manor Road. I remember the fish sellers, May Hughes used to come round the streets with a pram full of fresh fish, she would shout at the top of her voice to let you know she was there! Finally, it is my dad with his carrier bike in front of the Victoria Fountain. Anyone know who the guy withe the dog is?